Budapest is one of my favourite cities to visit and explore. Its breathtakingly beautiful with a spa or café around any corner (so what’s not to like!). I’ve been there more times then I can remember and I always love to return to enjoy more of the beauty of the city, either its during winter or the hot summer season. 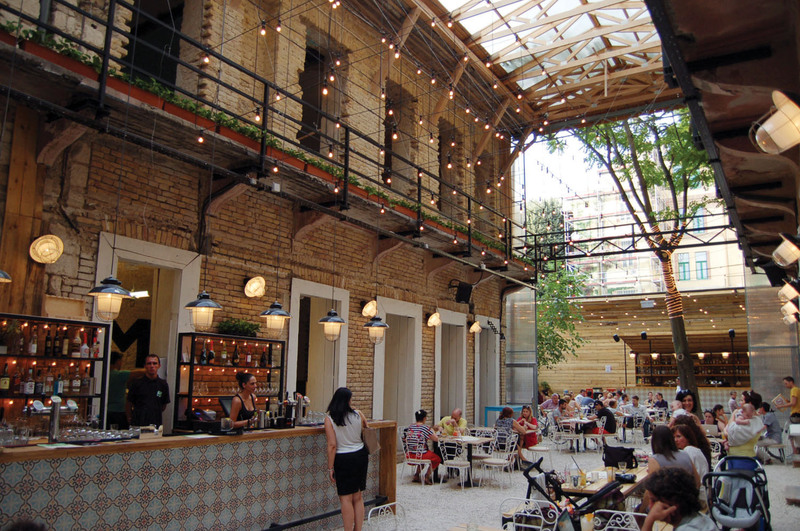 I also love the new emerging young Budapest, which is very creative and chic. So I really think Budapest have the best of both worlds. This is a real gem located in District VII (the Jewish Quarter which I highly recommend). They serve delicious vietnamese food. The food is fresh and the staff is very friendly. They will help you identify what is vegan on the menu. We went back there for a second evening. Since the food is lovely and the setting is super romantic and cozy. 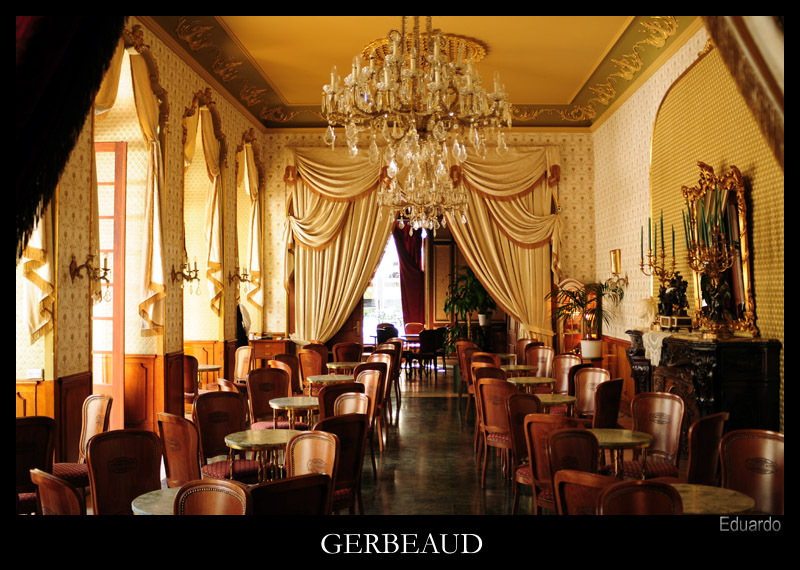 This is truly the most beautiful cafe in the world. Opulent, gilded and it feels like being inside a dream while sipping on your tea. When I was there we went for high tea, and as New York Cafe serves, coffee, cakes and Hungarian cuisine we had to pre-order a vegan version. They do accommodate allergies or food choices, just call a head and make a reservation. You can get into New York cafe without one, however I do recommend to book a table. This is such an wonderful experience with the setting, the service and the ambiance of the surroundings. 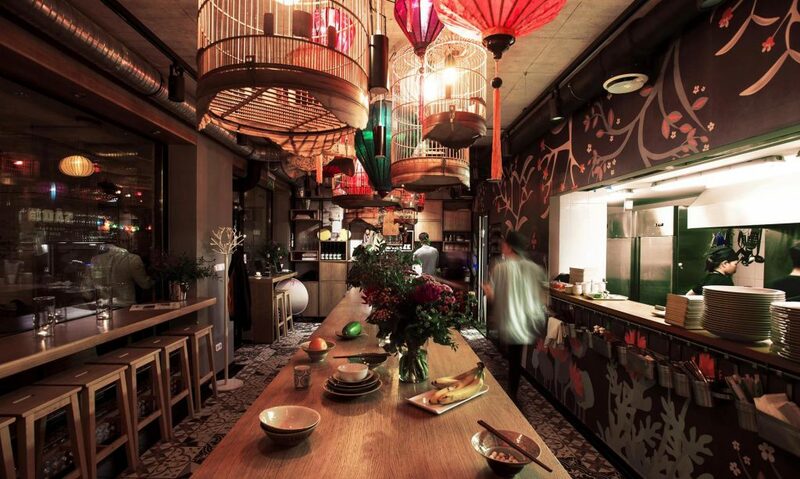 The setting is quite unique with its huge bric ceilings and garden and it’s perfect for a casual dinner. Vega City is like a deli where you order over the counter and either eat in or take-away. 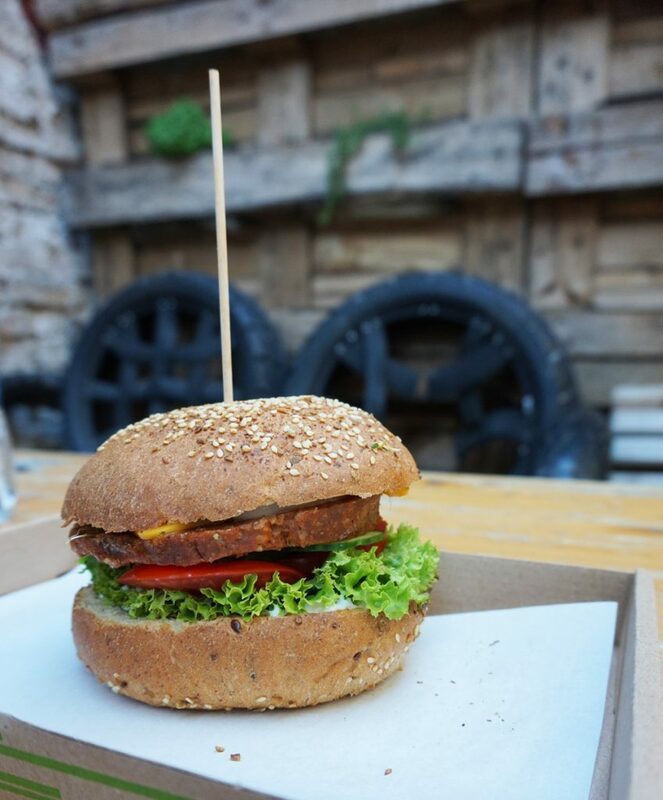 Everything is vegan and they serve a selection of both Hungarian, western food and smoothies. A coffee place where you can pop-in for a coffee, I used to recommend this place before as they made me vegan sandwiches, however they don’t have this on the menu anymore. So if you are looking for a decent cup of coffee, you can go here. 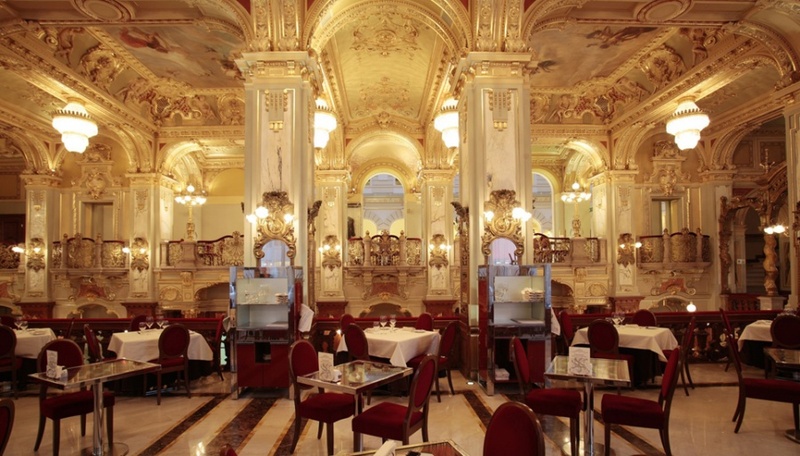 But I would recommend Budapest Baristas instead, which are located just a few metres away. 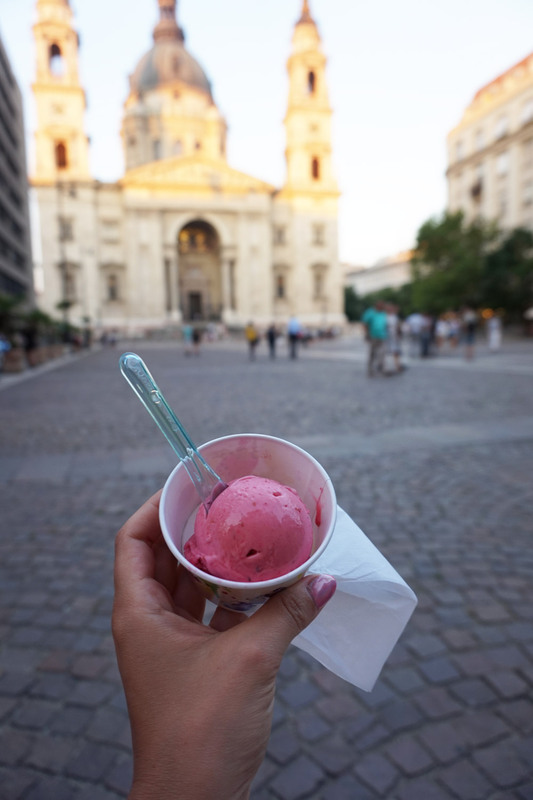 Located in the same street as Fekete on the Museum Quarter you will find Budapest Baristas. As I’ve had real trouble finding god coffee in Budapest when I first visited, I’ve collected a few gems where I can get good coffee and enjoy a latte with soy milk. I enjoy their coffee since they have a selection of plant based milks to choose from. This time around it became our regular breakfast spot. 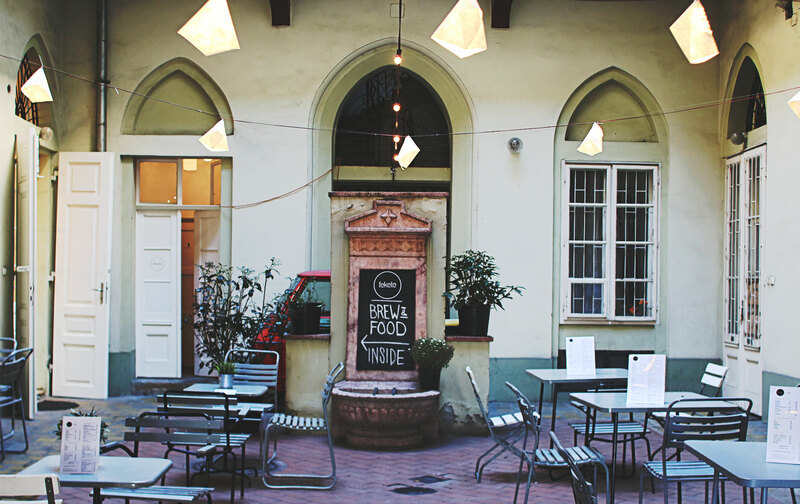 They offer fresh, healthy food for breakfast and they are a rare gem in Budapest. Their chia pudding is vegan and is made with creamy coconut milk and a sugar free raspberry jam. 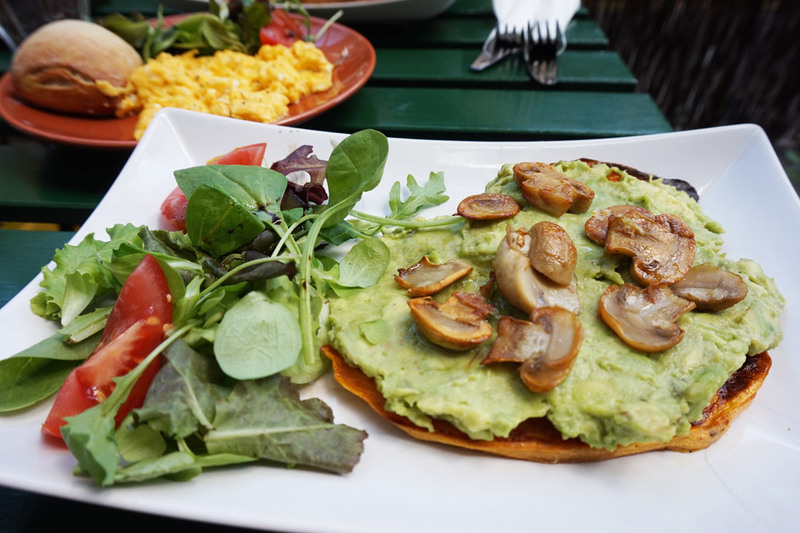 They have a few items on their menu which are vegan such as the yam toast with avocado – I loved this! And the bagel which you can order with avocado as well. My favourite is the yam toast with avocado and an order of extra mushrooms on top. They also have one vegan cake, which I never got the opportunity to try as I don’t eat cake for breakfast. This is Hungarys prime chocolate maker which also has a cafe. It’s beautiful and worth a visit to enjoy the setting as well as the adjoining chocolate shop. By high quality (non-dairy) vegan chocolate bars in opulent packaging. They do have the best dark chocolate dipped roasted almonds I’ve ever had. The menu in the bristro is not me most vegan friendly but they have tea and I really recommend a visit just for the chocolate shop and to enjoy the setting. 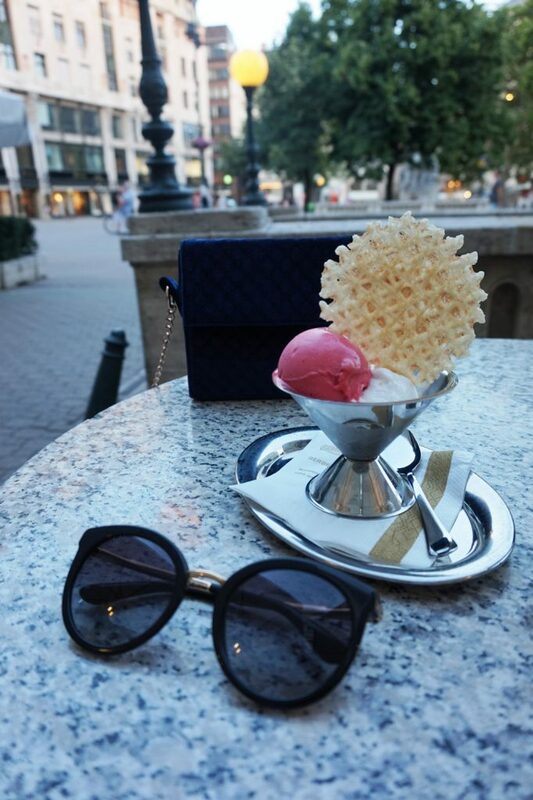 They do however have ice cream in the summer, so I highly recommend sitting outside and watch the square and enjoy their dairy-free ice creams. I had raspberry and lemon, both divine! A quaint organic food shop if you need to stock up on vegan snacks. This is a real gem. It’s accessible from one of the main tourist trap streets in Budapest. (Don’t ask me which one..) However the shop/cafe got a very unnoticeable entrance from the street. You step away in an entrance away from the street and walk straight into a small quaint courtyard with small chairs and tables, with bamboo trees decorated with tea strainers amongst other things. They have a large selection of the worlds finest teas which you can enjoy. Their menu features a range of vegan options, clearly marked so. I recommend their Baba Ganough with warm pita bread. So nummy. We went there twice and the food, tea and service was absolutely top notch. I managed to get my hands on some Pu-Erh Tea – I haven’t been able to buy this since moving away from London. The shop-owner and staff is really friendly. The courtyard offers a nice place to sit, serene, away from the tourists with a nice shady area to relax and just enjoy the moment with a teacup in hand. I love, love, love hummus so I could eat here everyday! I loved my plate of hummus with mushrooms, bread, and different hot spicy sauces. The staff is absolutely lovely and the prices are great. I ate well and a lot of food for maybe 1000 forint. several locations, see website for details. This is a Japanese style restaurant. I had a cucumber salad with seaweed and grilled tofu on the side the first time we went. The second evening we went there I ordered a salad with herbs, tofu and a wasabi dressing. It was very, very nice. The vegetables where fresh and they made a nice and full mix of the different herbs, sprouts and salad leaves. The staff at Kyoto very friendly and open to any special requests. We ate there twice during our stay because they could accommodate for my request and they had great cocktails for dessert. UPDATE: This used to be a restaurant named Kyoto, but it’s now Tokio, however the menu seems similar. Located: at several places around the city, view website for details. This was a true fine dining experience with perfect food and waiters taking the best possible care of you. Of course I loved our dinner there. I would advice that you pre-book a table and also tell them that you are vegan. I thought that they would naturally have “accidental” vegan dishes on the menu, when I quickly went trough it online. This was not the case, but they made three dishes vegan for me, one which was not on the menu. The food was incredible in presentation, texture and flavour. This is one of the food courts in the old Jewish district. They have one vegan stand and that’s the Las Vegans burger van with a selection of different burgers and fries. I had the seitan burger, with vegan cheese, mayo and broccoli sprouts which was one of the best vegan burgers that I’ve ever had. And trust me, I’ve had plenty of vegan burgers in my days. I was going to order some traditional Hungarian food until I got seduced by their pizza menu…and I ordered a Calzone instead. Now, I’ve heard great reviews about this restaurant from other vegans. But I’m so sad to write that I am disappointed. We specifically asked to have our food delivered to us at the same time. My friend ordered a Gulash and bread, I ordered a Calzone. The waitress kind of forgot us after that, I wanted to order a dessert. I gave up waiting so I went up to the counter and ordered from their pastry selection, and a cup of tea. I waited for 20 minutes, still no dessert or tea. So I went and reminded the waitress, she confessed and said she forgot the tea and cake I ordered. Ten minutes later I went and reminded her again about my dessert and the cup of tea. Then the dessert came and my cup of tea, might I add it was a bag and hot water I was served. We asked for the cheque straight away as you might understand. No – I didn’t tip them a dime. I also reminded her that I ordered a bottle of water, that I paid for before leaving. I hope they employ more people and that next time I visit, that they give me a better experience. The photographs are borrowed from various websites. I do not have copyright on them, and if a photo is yours and you dont want me to use them or if you want a link to your site. Just send me a note and I’ll arrange this. Thank you for writing this. Im here with my mum right now and we’ve tried so many of your recommendations! We went to Sao, Karavan and Mazel Tov. You nailed it each time. We’ll be trying budapest baristas today hopefully. Thanks again!! Thank you for taking the time to comment, I’m delighted that I could help you find vegan food and I hope your stay in Budapest was lovely.